I. Choleh Sheyaish Bo Sakana – Someone who is ill and whose life may be in danger. A choleh sheyaish bo sakana may use any non-kosher medication if an equally effective kosher medicine is not readily available. Included in this category is someone whose life is currently not in danger, but if untreated could develop a life threatening complication. This includes an elderly person who has the flu or an infant with a fever. One who has a heart condition, diabetes, substantially elevated blood pressure, kidney disease, severe depression or any other serious condition. Someone with an infection (except for those skin infections known to be non-life threatening, e.g. acne) may take antibiotics. A pregnant woman whose life is in danger (e.g. blood clotting disorder, toxemia), or who is in active labor, or who is in danger of having a miscarriage. A woman who has given birth within the past seven days without any known complications or who has postpartum complications that are or may become life threatening. This may apply for an extended period of time, depending upon her condition. All instructions given by the doctor should be carefully followed, including taking the medication for the prescribed number of days, even though the symptoms may have subsided. This also applies to non-kosher medication that is flavored and tastes good. All of the above is equally applicable on Pesach to medication which contains chometz. One who is experiencing symptoms of the flu. One who suffers from chronic debilitating arthritis pain. One who suffers from migraine headaches or mild depression. A pregnant woman suffering from non-life threatening complications (e.g. lower back pain). A woman who has given birth in the past thirty days without any known problems or who is experiencing non-life threatening postpartum complications. This may apply for an extended period of time. Those listed above may take non-kosher medication shelo k’derech achila, in an uncommon way of eating, if a kosher alternative is not readily available.3 Items which are designed to be swallowed4 without chewing (caplets, swallow tablets, and even gelatin capsules), poor tasting chewable tablets, and poor tasting liquids have a shelo k’derech achila status. For example, if someone has the flu, and the only fever reducer available is a non-kosher gelatin capsule, one may swallow the product. Similarly, one may swallow Celebrex in a gelatin capsule or tablets containing chondroiton (derived from non-kosher bovine trachea cartilage) for chronic debilitating arthritis pain.5 However, under normal circumstances one may not take non-kosher products if it requires eating in a normal manner (e.g. non-kosher chewable tablets that taste good). III. Maychush and Baree – One who is experiencing slight discomfort6 (e.g. slight joint pains or a runny nose) or is healthy7 and takes vitamins and supplements to maintain good health should make every effort to ensure that the product is either kosher certified or contains all kosher ingredients. If this is not possible, a Rav should be consulted since in some instances non-kosher products taken shelo k’derech achila may be permissible.8 Taking non-kosher medication that requires eating in a normal manner (e.g. non-kosher chewable tablets that taste good) is not permissible. If a person is healthy or has a slight discomfort and his physician advises that there is a high risk of him becoming a choleh sheyaish bo sakana or even a choleh she’ain bo sakana, this person may take non-kosher supplements shelo k’derech achila, in an uncommon manner. For example, if a doctor advises HRT9 to a middle-aged woman to avoid osteoporosis, a common condition in older women, she may swallow a non-kosher capsule or tablet if an equally effective kosher substitute is unavailable. Similarly, if a doctor advises swallowing a specially formulated non-kosher vitamin for someone who has a high risk of developing macular degeneration (a disease in the central part of the retina that leads to blindness), one is permitted to swallow the product. However, if a healthy individual wishes to take non-kosher supplements to prevent an illness which is unlikely to occur, a Rav should be consulted, since the halacha is similar to one who has a maychush. The following addresses the various halachos regarding specific products. If the tablet is definitely non-kosher or contains ingredients that may be non-kosher (e.g. polysorbate 80, triacetin), a sick person – even though he is not in danger – may take it shelo k’derech achila.12 However, one who has a maychush and finds it necessary to take such a non-kosher medication should consult a Rav.13 The same is true for a sick adult or child who is not in danger but requires non-kosher flavored chewable tablets (i.e. k’derech achila). III. Syrups and Liquids – These products are considered k’derech achila because they contain flavors which give them a good taste. The most problematic ingredient (but by no means the only such ingredient) in these products is glycerine. This ingredient, which is not batel b’shishim in the elixir and if present is usually listed as an inactive ingredient, is derived from animal, vegetable, or petroleum sources. Unfortunately, it is very difficult to determine which is used because glycerine is sold by distributors who often sell both kosher and non-kosher grades to pharmaceutical manufacturers. Therefore, one should preferably purchase cough syrups, children’s liquid medications, and other elixirs with a hechsher or review the label to ensure that the product does not contain glycerine or other possibly problematic ingredients. Multi-vitamins often contain non-kosher ingredients that are not listed on the label. In particular, natural vitamins A and D may come from non-kosher sources. In addition, vitamin E, beta carotene, and natural or synthetic vitamins A and D may be mixed with non-kosher gelatin.15 A kosher brand is recommended. Under normal circumstances, one may not take a chewable non-certified multi-vitamin. Single vitamin (e.g. vitamin C) or supplement tablets should ideally be certified with a hechsher. If one determines that the component and inactive ingredients are kosher, the product may be taken without certification. VI. Dairy – Often, medicines contain lactose, a dairy ingredient which serves as a bulking agent.21 If one eats meat, he should wait at least one hour before taking these dairy products.22 This is certainly true if it is shelo k’derech achila. This is very relevant to OB-GYN prescriptions for women, as they often contain lactose. VII. Shabbos – One who has a maychush on Shabbos may not take medication or supplements to help alleviate the discomfort.23 However, someone classified as a choleh (whether in danger or not) may take all necessary medication. Someone taking medication to avoid a serious illness (e.g. someone with high blood pressure or high cholesterol) may do so on Shabbos even if there is no sakana. On Shabbos one may take antibiotics for an infection.24 A pregnant woman may take all necessary medications and vitamins on Shabbos. Someone who is in good health and takes a product to change the normal function of the body (e.g. caffeine pills to avoid falling asleep), may also take this product on Shabbos. VIII. Tefilla – When taking medication, it is proper to say the following tefillah25 where one asks that Hashem allow the medicine or procedure to cure the illness: Yehee ratzon milfanecha Hashem Elokiey sheyehai aisek zeh lee l’refuah kee rofeh chinam ata. The Chofetz Chaim explains that the purpose of this tefillah is that one should not think that the medicine is the only part of the cure. Rather, it is the Ribbono Shel Olam who causes the medicine to take effect. With this tefillah, one who is G-d forbid ill is given the opportunity to place his trust in the true Rofeh Cholim. See Taking Your Medicine section for related articles and Medication Lists. For medication on Pesach see: Pesach Medication & Cosmetics: The Halochos & Lists article. 1. Based on research conducted by IMS Health, Inc.
2. This article is based on several different articles that have appeared in Kashrus Kurrents during the past decade. The purpose of this article is to address the kosher status and halachos of these remedies. It is in no way intended to advise consumers as to whether a specific product is effective. One should consult with his physician or health advisor regarding the effectiveness and side effects of each product and determine which products may be taken. This article addresses year round kashrus and is not a Pesach guide. For Pesach information, see the Star-K Pesach Guide published annually. 3. Shulchan Aruch YD 155:3. 4. See Minchas Shlomo 17. 5. Glucosamine, another common arthritis remedy, is now available in kosher form. The Star-K certifies vegetable-based glucosamine distributed by Nutralife Health Products of Lakewood, NJ. Unless otherwise specified on the label, most other glucosamines on the market are derived from crab, shrimp, or lobster shell fish which are not kosher. Whether one may swallow such a non-kosher product may depend on his level of pain. A Rav should be consulted. 6. He has a maychush. 7. He is a baree. 8. See Shach YD 155:13, based on the explanation of the Chochmas Adam (in Binas Adam 52). See also Mesorah vol. 14, pg. 90. 9. 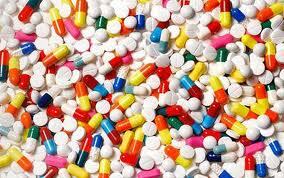 Hormone Replacement Therapy – These products are often derived from non-kosher animal sources. 10. Opening the capsule and removing the “kosher” powder contents is not always advisable, since removing the gelatin capsule may cause the product to lose its intended effect. A pharmacist or doctor should be consulted to determine if this method is advisable. A liquid inside a gelatin capsule may be rendered non-kosher based on the principle of kavush k’mevushal. Hence, squeezing out the “kosher” contents may not be a solution, as the contents may have been rendered non-kosher. 11. One can assume the stearates are not nosain ta’am in the product even if they are more than one sixtieth. Regarding flavors added, although food products with natural and/or artificial flavors must have a reliable hechsher, one can assume they are batel in a medicine or vitamin (for various reasons davar she’avidi l’taama afilu b’elef lo batel does not apply). Regarding equipment, one need not be concerned that the medicinal ingredients were produced on non-kosher equipment (see Shulchan Aruch YD 122:6 stam keilim ainum b’nei yoman). 12. As defined above in the choleh she’ain bo sakana section. 14. Cough syrups and pain relievers contain a maximum of 20% glycerine (a 1:5 ratio). When 1 tsp. (5 ml) is mixed into at least 2 fl. oz. (60 ml – making a 1:12 ratio) of water, juice or soda, the glycerine becomes batel b’shishim (a 1:60 ratio). There is no problem of chaticha na’asais nevaila, since a choleh has the status of a “hefsed gadol” and the Rama YD 92:4 says there is no chaticha na’asais nevaila by lach b’lach b’shaar issurim b’hefsed gadol. Under normal circumstances, one may not add 60 times kosher food to non-kosher food to nullify it. For example, one cannot add pieces of bacon to a cholent sixty times larger than the bacon, thereby being mevatel it. This only applies to food which is unquestionably not kosher. However, one is permitted to be mevatel safek issur (see Shach YD 92:8). Therefore, since the cough syrup is only safek issur (the glycerine may be kosher), one could be mevatel it by adding it to a kosher beverage. The Star-K discussed this with various companies who determined that cough syrup does not lose its potency by adding the prescribed amount to other beverages. These companies recommend mixing it with orange juice, apple juice, or water and drinking the entire solution. The reader is cautioned that these methods and percentages of bitul cannot be applied to other cases (see Rama YD 92:4). If dilution presents a difficulty (e.g. for an infant), a Rav should be consulted. 15. This is done in a process called micro-encapsulation where the vitamin is spray dried on a base of gelatin. The gelatin is often not listed on the label of the finished product. Whether one may take such a vitamin depends on the reason he requires the product, as addressed in the Categories of Illnesses section above. 16. For a listing of kosher prenatal vitamins, see the Star-K OB/GYN Approved Medications List. 17. For example, if the product label states lac caninum-4C, this indicates dog’s milk (non-kosher) was mixed with 99 parts of a dilutant (the letter “C” means in the finished product the mother tincture is 1:100). The mixture was again mixed with a dilutant at a ratio of 99:1. The process was repeated four times (as indicated by the number 4). If one determines that the dilutant is kosher, the remedy may be taken, as the dog’s milk is now only one part in 100 million! If the label states 60C, the non-kosher ingredient is diluted at a ratio of one part in 10060 (i.e. 1:1000…[120 zeros following the 1!]). If the label states 6X, this indicates the mother tincture was mixed 1:9 (“X” indicates the mother tincture is at a ratio of 1:10 in the finished product) and then again a portion of this mixture was mixed at a ratio of 1:9. This process was done six times. 6X constitutes bitul, as the original non-kosher ingredient is batel (at a ratio of 1:106 which is one to a million). 18. It should be noted that alcohol used in flower remedies may be from brandy and is generally non-kosher (stam yainum). 19. One can say the primary ingredient of this remedy is batel b’shishim. The dilutant (alcohol or lactose) is a safek d’rabonon (safek stam yainum or gevinas akum). Therefore, if it is impossible for the one who requires this remedy to determine this, one may be able to say safek d’rabonon lekulah, especially in a case of shelo k’derech achila. It should be noted that a product containing a trace of a non kosher or possibly non kosher ingredient (even if it is batel bshishim) cannot be certified Star-K or Star-D.
20. In remedies, one can assume the solvent is kosher (see previous footnote). One must review the other inactive ingredients. The herb is kosher. (However, if from Israel, one would have to address the Terumos and Ma’asros issue. Unless otherwise specified, one can assume it is not from Israel.) It should be noted that not all products sold with “herbal remedies” are derived from herbs. For example, royal jelly often sold with herbal remedies is not kosher, as it is secreted from the glands of bees. 21. If one keeps cholov Yisroel and requires medicine containing lactose, a Rav should be consulted. The possibility to be lenient is based on the following: Lactose is made from whey which is a by-product of cheese. There are Poskim who permit the use of non-cholov Yisroel cheese when the cow was milked to make cheese (see Rama YD 115:2). Today, one can assume cheese was made from such milk. This heter also applies to whey and lactose. 22. See Pischai Teshuva 89:3. 23. Shulchan Aruch 328:1 – This halacha also applies to Yom Tov but does not apply on Yom Tov Sheini (i.e. the second day of the Shalosh Regalim [Pesach, Shavuos and Sukkos], the last day of Pesach, and Simchas Torah) – see Mishna Brura 496:5. For purposes of this halacha, the second day of Rosh Hashana is not considered Yom Tov Sheini and this halacha applies. 24. Someone with acne should consult a Rav whether the medication may be taken on Shabbos. Whether one may take vitamins on Shabbos depends on each situation and is beyond the scope of this article. A Rav should be consulted. 25. See Shulchan Aruch OC 230:4 and MB ibid. 6.